Do I get affiliate commissions on B2? What is the best link for me to use? But your affiliate ID most likely is not af9999! So please be sure to use your affiliate ID or you won't get credit for any sales. Can my Affiliate Link land on another web page on the Backblaze web site? Can I redirect to web pages on other sites using this mechanism? No, just to pages on the Backblaze web site. Can I have my own landing page on the Backblaze web site? We reserve the option to provide a co-branded web page on our web site for our best Affiliates. If this something you are interested in, send a request to the Backblaze Affiliate Marketing team. Your Affiliate Link is really long and people I give it to can’t remember it. What can I do? Make a web page on your site that redirects to Backblaze for example: www.mycompany.com/backblaze redirects to your Affiliate Link. Make your affiliate link into a “nameable” bit.ly link for example, bit.ly/buybackup. This will require that you have a bit.ly account. How can I be sure that my Affiliate ID is being used when a user installs Backblaze? When the user downloads the Backblaze software on their system the name of the Backblaze file in the downloads folder will tell you if it was recorded against your Affiliate ID. For example the file named install_backblaze-af999964dc5.dmg means that Affiliate af9999 will be credited with the installation and the subsequent purchase. I have a really great idea for a promotion, who do I talk to? Send an email to our Backblaze Affiliate Marketing team to get started: [affiliatehelp (at) backblaze (dot) com]. Will Backblaze advertise on my web site/blog/newsletter/etc? Our advertising budget is limited, so we don’t typically do this, but you can always ask by sending an email to the Backblaze Affiliate Marketing team. I really like a graphic on your web site, but it’s not in the Affiliate resources package, can I use it anyway. Probably, but ask us first. Sometimes we license a photo or graphic to use on our web site, and you do not have the rights to use it. Do you offer discounts and coupon codes I can use? From time-to-time we do offer these type of promotions. The Affiliate e-newsletter will provide notice and details of such programs. Affiliate e-newsletter, how do I get that? When you signed up as a Backblaze Affiliate you agreed to accept email from us such an the Affiliate e-newsletter. If you unsubscribe from receiving our email you will no longer receive such correspondence. Speaking of email can I get the list of the email addresses I referred to Backblaze? No. When the user signs up they are contracting with Backblaze for the service. Our privacy policies prohibit us from sharing personal user information, such as an email address, with anyone. We are a Reseller, can we use the Affiliate Link? Yes, the terms are the same as those of an Affiliate. Can I add my logo to the Backblaze product or the Backblaze installer? Can I use my Affiliate Link to link to my web site. Not at this time. As noted previously, we can provide a co-branded web page on our web site for our best Affiliates. One of my customers who uses Backblaze has a problem, who should they contact? Backblaze provides support. Just have the user visit our support web page for more information. I sell Backblaze for Business to my customers. Do I get Affiliate credit for those sales? You get sales credit for Backblaze for Business sales, but currently these sales are recorded separately from your Affiliate sales. 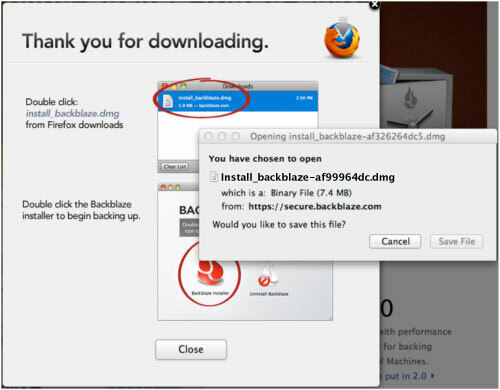 Can I have a copy of the Backblaze installer on my web site? Yes, but we discourage this. We update the installer from time-to-time and your version would be quickly out of date. Instead use the download installer Affiliate Link trick we showed earlier. Can I get a monthly report automatically sent to me for my Affiliate ID? We produce reports when requested. So if you ask once a month we will produce it. Do I get any reports automatically? When your have reached your payout threshold ($100), we will send you a report for your Affiliate ID. What kinds of data are on the report? You will the get the number of landings, downloads, create accounts and sales for your Affiliate ID. You will also see the amount of sales credited to your Affiliate ID and your current commission.